I’ve chosen this photo not because of any particular technical or artistic merit, but because it expresses the way I feel about living in Nova Scotia. My family and I moved here four years ago from Toronto, after our need to live there for work commitments ceased. The conversation started with “Do we want to continue to live in the city?” and ended up with “We could live anywhere, you know.” The possibility of Nova Scotia suddenly became real. Certainly, any time we’d visited the province (my wife has two siblings living here), we’d remarked on the province’s beauty and the more “laid back” atmosphere. Native Nova Scotians invariably want to know what brought us here. Four years on, they (and Ontarians) want to know if I have any regrets. The short answer to the last question is an emphatic NO. Oh, there are annoyances, just as there are anywhere one might choose to live. But I feel more comfortable and “at home” here than I ever did in all the years I lived in Toronto. In part, it’s because we now live in a small town compared to the big city. It’s more than that, though. 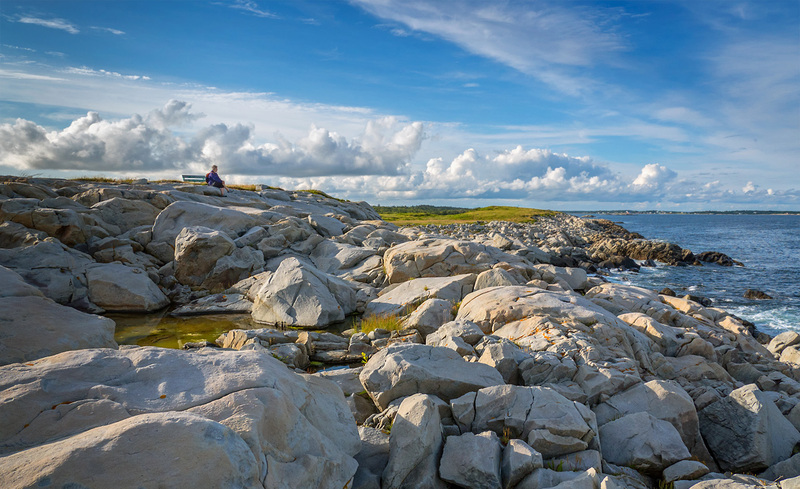 Most Nova Scotians – including the “come-from-away” population (or, as one friend rephrases it, “here-by-choice”) – seem more genuine, grounded, and at-ease than what one experiences in a metropolis such as Toronto. The photo above expresses another, very important part of why I love living here – the proximity to the sea. This is West Head, a small promontory near the town of Lockeport. My wife and I arrived for an evening picnic on a day that began with rain and fog, but had opened up as the day progressed. The evening light and the ocean air lent an almost magical atmosphere to the landscape. West Head is one of those places where you feel you can really breathe and feel at ease. And there are many such places in Nova Scotia. My sister-in-law from the Valley says the locals sometimes use the phrase “it’s a large day”. A Middle English word, large used to mean generous and bountiful. And that’s how I feel about living in Nova Scotia. Most days are large days. Very a insightful.Claire you make a power statement about staying innovative Scotia! Excellent!